The Cupola observatory module was installed in February of 2010. You thought selfies with Ellen were record-breaking? How about selfies in space? On Monday, the International Space Station’s Instagram account uploaded the first (human) selfie taken in space. The subject was American astronaut Steven R. Swanson. In the background, you can see the Earth in the background, photobombing like no other. 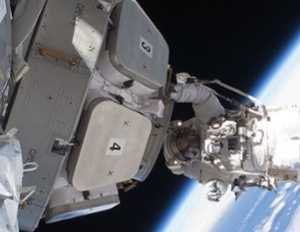 The photo was taken in the observatory module of the space station, the Cupola. Installed in 2010, the seven-window module holds the record for having the largest window in space, at 31 inches. Steven Swanson departed from Kazakhstan for the space station on March 25. Swanson is an accomplished astronaut, logging over 643 hours in space and spending over 26 hours outside over the course of four spacewalks. He was the lead spacewalker on the space shuttle Discovery, installing the S6 truss on the International Space Station. Today, the ISS Instagram account showed off another photo in space, this time of Swanson drawing blood.